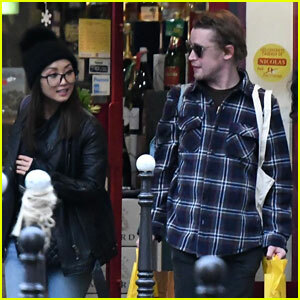 Macaulay Culkin went out to do some grocery shopping in Paris, France along with his girlfriend Brenda Song, multiple sources have confirmed. The 37 years old Home Alone actor and the 29 years old actress, who rose to fame on Disney Channel’s The Suite Life of Zack & Cody, were caught picking up some items late last month. The couple bought bread, mushrooms, and celery, among other items. Boogie Town star Brenda donned a furry shirt, black leather jacket, ripped blue jeans, and a black pom beanie, while Macaulay rocked a flannel shirt. The couple looked happy as they headed out of the store on the chilly fall day. Macaulay was previously married to Rachel Miner but the pair parted ways with a divorce in 2000, just two years of their marriage. Brenda, meanwhile, was engaged to Miley Cyrus’ brother Trace Cyrus but the duo called off the engagement in 2012.